Friends and supporters of the Franco-Swiss team were in Barcelona today to take part in the christening of their yacht Mirabaud by the famous Spanish singer. 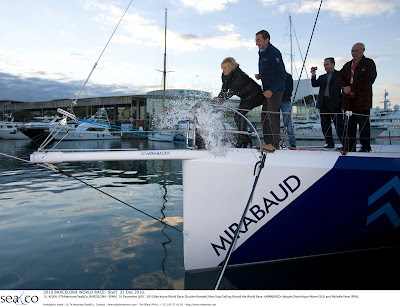 Barcelona, 18th December 2010 – With only two weeks to go before the start of the Barcelona World Race, Dominique Wavre et Michèle Paret’s yacht was officially baptised ‘Mirabaud’ this evening by Spanish singer Ainhoa Arteta. 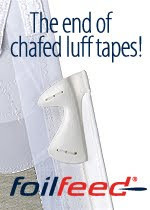 Mirabaud & Cie, banquiers privés, have been involved in competitive sailing for many years. From 2003, the bank has also been an avid supporter of classical music, in particular through the ‘Mirabaud Concerts’ at the Lauenen Chamber Music Festival and in their partnership with the London Philharmonic Orchestra. Ainhoa Arteta attended the San Sebastian Conservatoire and later studied at the Actor’s Studio in New York before her debut at the Palm Beach Opera in Florida. She is hailed as one of the Iberian Peninsula’s greatest classical singers. "My career has offered me the opportunity to live moments of exception such as this one, and to meet extraordinary people like Dominique Wavre and Michèle Paret", she said. "I wish you good luck for this extraordinary adventure." Thanks to the support of Mirabaud, Dominique Wavre and Michèle Paret have been able to carry out major improvements to their boat. The keel box has been replaced, in addition to many modifications designed to improve the balance, and therefore the performance, of the yacht. An improved chart table has been designed and fitted, and a new lighter engine installed in the bilges.